CAMBRIDGE, Ont. -- Research on a new instrument to more accurately detect radiation on board the International Space Station is just one of several dozen projects that will be funded under a Canadian Space Agency program. The radiation project will be undertaken by BTI -- Bubble Technology Industries Inc., of Chalk River, Ont. 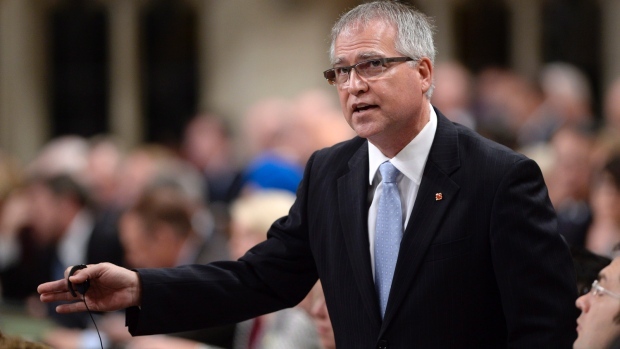 Federal minister of state Gary Goodyear was in Cambridge, Ont., on Friday to announce that 21 high-tech firms will receive close to $13.1 million for research and development over two years. He made the announcement at the offices of COM DEV International Ltd., which will receive funding to complete seven projects. MacDonald, Dettwiler and Associates Ltd. (MDA) of Richmond, B.C., and Neptec Design Group Ltd. of Ottawa will each undertake five space-related projects with their funding. -- the development of technologies to allow small low-cost space missions to survive in the extreme thermal environment of deep space. -- a spectrometer to measure greenhouse gases in the atmosphere. -- a project to develop and test-fly an instrument that could explore the surface of asteroids. -- the development of a high-resolution next-generation thermal camera to inspect spacecraft. A backgrounder provided by the space agency says 18 projects will get funding of $600,000, while 20 projects will receive $200,000 or less. Each company is also contributing a minimum of 25 per cent of the total value of its project.